This is an index to J.R.R. Tolkien's texts in the tengwar script he devised for the Elves of his sub-creation. It is maintained by the Mellonath Daeron, the linguistic guild of the Tolkien Society Forodrim. Among the guild members are found the editor of the Arda annual (himself a major contributor to the index) and several of its recurrent contributors. The index is a work in perpetual progress with references being added continually. Mellonath Daeron also maintains the DCS, a corresponding index to texts in the cirth script of the dwarves. All references are given in the structural format of the Arda annual. For bibliographical information, see Åke Bertenstam's chronological list of Tolkien's published writings. In the figures given for "Characters", characters that define a position (tengwar and carriers, not tehtar) are counted, but not spaces or punctuation. Ligatures with <silme> as a hook or loop attached to another tengwa are counted as single characters, except when the hook carries a vowel tehta (occurs in "The Brogan Tengwa-greetings". The number of characters so defined is seldom in doubt (but our figures may not be beyond emendation). The totals for longer samples may suffer from miscounts. Avoiding the problems of true transliteration, we give transcriptions with normalized Roman-letter spelling. Spaces, but not punctuation, are also supplied when necessary. This index does not constitute an attempt to analyse the ortography or history of tengwar. Two lines of tengwar writing on a large jar filled with gold. The jar is so high that a ladder is leaned against it, unfortunately obscuring parts of the writing. With obscured parts marked with ***, the upper line reads "Gold th***[= Thror?] Thrain", and the lower line "Accursed ***[= be? die?] the thief". The text of the Ring-inscription written along the outer rim of the depicted Ring. The tengwar are the same as in "The Ring-inscription". Authorial transcription (LR 2 II:113): "Ash nazg durbatulûk, ash nazg gimbatul, ash nazg thrakatulûk / agh burzum-ishi krimpatul." This specimen is mentioned in LR App.E II Fëanorian:3, footnote. The Author further explains: "In the Ring-inscription the curl open to the right is used for u" (LR App.E II Note:4). Cf. DTS 33 & 34. The tengwar <lambe> <ando> <lambe> on a depiction of the throne of Elendil. Authorial transcription (LR Foreword:10 (India paper edition)): "L. ND. L". Although consisting of three separate letters, the specimen is called "monogram" (ibidem). The text continues the cirth-inscription at the top of the page. Transcription: "of Westmarch by John Ronald Reuel Tolkien. Herein is set forth the history of the War of the Ring and the return of the King as seen by the Hobbits." In this version, the tehtar in seen are dots, which was corrected for following impressions; see further "The Lord of the Rings Title-page Tengwar (Corrected)". The correction is that the tehtar in seen are now 'acute accents'. This specimen is mentioned in LR App.E II Fëanorian:3, footnote. The Author further explains: "on the title-page [the curl open to the right] stands for o, and the curl open to the left for u" (LR App.E II Note:4). A longer comment is found in LR App.E II Note:8. In the original edition this specimen was used in each of the three volumes on a general title-page for the The Lord of the Rings, and also on the volumes' individual title-pages. This arrangement is common in three-volume editions. In one-volume editions (from TBibl. :A21:ba / Hammond A5g onwards), the specimen occurs on the single title-page. There is a reproductional variant (for instance in TBibl. :A21:ba / Hammond A5g) where the carrier of the i-tehta in Tolkien is joined to the <quesse> at its middle, as well as at top and bottom. The tengwa occurs in the text: "fireworks ... each labelled with a large red G <ungwe> and the elf-rune, <certh 19>." The hobbit-children recognized one or both of the characters: "'G for Grand!' they shouted" (LR 1 I:27). Reference: LR 1 II:72, ill. The text on the One Ring, visible only when the Ring was heated: "fine lines, finer than the finest penstrokes, running along the ring, outside and inside: lines of fire that seemed to form the letters of a flowing script" (LR 1 II:72). The specimen consists of two lines, probably corresponding to the outside and the inside of the Ring, respectively. The tengwar are the same as in "The Jacket Ring-inscription". "'I cannot read the fiery letters,' said Frodo" (LR 1 II:73), and Gandalf explained that "[t]he letters are Elvish, of an ancient mode, but the language is that of Mordor" (LR 1 II:74). For an investigation of the various reproduction variants, including upside-down printings, see Gary Hunnewell: "The Ring-inscription as a Guide to Publishing Histories" (Ravenhill 65 (December 1993), pp. 6-26). Depiction of the West-gate of Moria, with its signs in ithildin drawn by Celebrimbor. There is a <calma> in the upper left corner, an <óre> in the upper right corner, and a bold <ando> at the bottom of the door (presumably the initials of Celebrimbor, Narvi and Durin). On the arch of the gate there is a two-line inscription, which is explained and transcribed at the bottom of the picture: "Here is written in the Fëanorian characters according to the mode of Beleriand: Ennyn Durin Aran Moria: pedo mellon a minno. Im Narvi hain echant: Celebrimbor o Eregion teithant i thiw hin." The inscription on the gate was made before Second Age 1697, when Celebrimbor died. At the end of the Third Age, Frodo could not decipher it: "I thought I knew the elf-letters, but I cannot read these" (LR 2 IV:97). Although the text is not in English, it uses the Old Norse Durin and Narvi (presumably Tolkien's translations of names in a Mannish language related to Westron). There is a reproductional variant (for instance in TBibl. :A21:ba / Hammond A5g) with a dot above the single <ando>'s first lúva. Cf. DTS 25, 29, 30, 31. Reference: LR App.E II Fëanorian, table "The Tengwar"
"The table shows, in formal book-hand shape, all the letters that were commonly used in the West-lands in the Third Age. The arrangement is the one most usual at the time, and the one in which the letters were then usually recited by name" (LR App.E II Fëanorian:1). It contains thirty-six tengwar (1-36), in four columns (I-IV) and nine rows, with a line separating the upper six rows (1-6) from the lower three (unnumbered; containing tengwar 25-36). The Author explains: "The system contained twenty-four primary letters, 1-24, arranged in four témar (series), each of which had six tyeller (grades). There were also additional letters, of which 25-36 are examples" (ibidem). Each paragraph of L 118 contains a Christmas greeting to Hugh Brogan. The first paragraph is written with cirth (The Brogan Certh-greeting), the last two with tengwar, in a tehta-mode and a full mode, respectively. The second tengwa-greeting is the same, but with "and I hope". The specimen is "not dated, but possibly written at Christmas 1948" (L 118, Headnote). Three tengwa-elements are mixed into the alphabet-text (the position of the first is here marked *): "... I suppose your name is Richard, though you wrote *, which on your system should be Rijard (<anga> for <calma>)." Transcription: "Rijard", "j" and "ch". Since Tolkien has copied the mistaken name form from his correspondent (Richard Jeffery), it is not authorial except in execution. The letter is dated 7 September 1955. The specimen is printed below L 168, at the left margin. Transcription: "Namárië" (the "a" in the first syllable not written out). The letter is dated 7 September 1955. The main text on one of three representations of pages from the Book of Mazarbul, found by the Fellowship of the Ring in Moria, "slashed and stabbed and partly burned ... written by many different hands, in runes, both of Moria and of Dale, and here and there in Elvish script" (LR 2 V:3). This page is the second that Gandalf reads from, in LR 2 V:10, having noted that "there must be a number of leaves missing, because they begin to be numbered five, the fifth year of the colony, I suppose" (LR 2 V:8); see further "Middle Page from the Book of Mazarbul, Bottom Certh". The specimen is written in "a large bold hand using an Elvish script" (ibidem). "'That would be Ori's hand,' said Gimli" (LR 2 V:9). The leaf appears badly damaged, and not all of the text is intact. The picture is accompanied by a commentary and transcription by Christopher Tolkien, giving a fuller text than what Gandalf reads (P 24 (= 23 in 1st ed. ), note II). Cf. also "Last Page from the Book of Mazarbul, Last Line" (and the certh-specimens "Top Page from the Book of Mazarbul" and "Last Page from the Book of Mazarbul"). First published in The Lord of the Rings Calendar 1977. The manuscript of the specimen is kept at the Bodleian Library (MS Tolkien drawings 74). The last line on one of three representations of pages from the Book of Mazarbul, found by the Fellowship of the Ring in Moria, "slashed and stabbed and partly burned ... written by many different hands, in runes, both of Moria and of Dale, and here and there in Elvish script" (LR 2 V:3). This page is the third that Gandalf reads from, in LR 2 V:11, having noted that it "is the last page of all" (LR 2 V:10); it is written with cirth except for this line "in a trailing scrawl of elf-letters" (LR 2 V:11); see further "Last Page from the Book of Mazarbul". The script is similar to that on "Middle Page from the Book of Mazarbul", which may show that this line was written by Ori. Authorial transcription: "They are coming" (LR 2 V:11). The picture is accompanied by a commentary and transcription by Christopher Tolkien (P 24 (= 23 in 1st ed. ), note III). Cf. also the certh-specimens "Top Page from the Book of Mazarbul" and "Middle Page from the Book of Mazarbul, Bottom Certh". The manuscript of the specimen is kept at the Bodleian Library (MS Tolkien drawings 75). There is a large-size reproduction of the page on p.76 in the centenary exhibition catalogue, Tolkien: Life and Legend (Oxford: Bodleian Library, 1992). The main plate shows a drawing of Minas Tirith. At the top is written in pencil "Steinborg" and directly below the same word with tengwar. Transcription: "Steinborg" (the original edition has the transcription "Stanburg", later corrected). The latter reproduction (AI 168) also shows the sheet's margin with a crossed-out table of the Latin vowels with corresponding tengwar in pencil. The plate shows three sample pages of elvish script using tengwar. The language of all three is English; the writing mode uses separate tengwar for each vowel, but tehtar are used to denote phonetic variants of the vowels and preceding nasals of certain consonants. The text of Sample I is the beginning of the poem "Errantry" (The Adventures of Tom Bombadil). First published in The Silmarillion Calendar 1978. The text of Sample II is the beginning of the poem "The Adventures of Tom Bombadil" (The Adventures of Tom Bombadil). The text of Sample III is the beginning of the poem "The Adventures of Tom Bombadil" (The Adventures of Tom Bombadil). It is written in a different hand than samples I and II, and is considerably longer. A calligraphic rendering of Galadriel's High-elven farewell-song to the Fellowship of the Ring (LR 2 VIII:78-81), under the title "Namárië", the subtitle "Altariello nainie Lóriendesse", and with an extra Ai in the margin to the left of the first line. An authorial transcription is given in the book (R Namárië), though the actual tengwar-text deviates from this by a few scribal errors. The specimen is the same as "Namárië", except that it lacks the required dots under the <rómen> in the word omáryo. That the title and subtitle are here reduced in size and displaced is presumably no more than a productional choice of the publisher; on the second edition (Hammond B28e-f / TBibl. :A20ba-b) the title is excluded. An authorial transcription follows the specimen, though the actual tengwar-text deviates from this by a few scribal errors. In this variant tehtar and punctuation are printed in a colour, contrasting with tengwar in black; the contrast is reversed in the marginal Ai and the final Namárië, and in the initial position of the next-to-final Namárië and of each form of a name except Oiolossëo (not including the words Andúne and Rómello that are capitalized in the transcription). The contrast may be authorially designed, but appears to be produced by separation of a black-and-white original. The subscript 'Y-dots' are coloured as tehtar, except in the word ilye. Reference: R jacket back (not in all editions). R A Elbereth Gilthoniel, ill.
A calligraphic rendering of the Elvish hymn that Frodo heard in Rivendell (LR 2 I:169), under the title "A Elbereth" and the subtitle "Aerlinn in edhil o Imladris". An authorial transcription follows the second instance. In the second instance tehtar and punctuation are printed in a colour (except the dot over the initial carrier in in in the subtitle), contrasting with tengwar in black. The contrast may be authorially designed, but appears to be produced by separation of a black-and-white original. There is a reproductional variant, in Hammond B28e / TBibl. :A20bb, where the tehtar in the half-page instance are instead omitted. The reproduction usually printed in FCL is incomplete in that it lacks the stem of the first letter and the bow of the final lambe. A facsimile of the actual text is given in Letters from Father Christmas (HarperCollins Publishers, 2006). A page with a transcription in tengwar of ll.3994-4027 (beginning "So Lúthien, ...") in the A-text of "The Lay of Leithian" (it is not told if this page is isolated, or if more of the text was transcribed). Differences from the printed B-text are found in ll.4004, 05, 07, 08, 16, 17 and 27. A transcription and analysis by Donald O'Brien was published in Vinyar Tengwar 10 (March, 1990), pp.9-12. Reference: RS XXII (10), ill.
A page of calligraphic script, with some tengwa-elements. At the top is a form of the name "John Ronald Reuel Tolkien", and below this five versions of the initials "JRRT". At the bottom of the page are six lines of comment (about a preceding text in Roman letters), transcribed in RS XXII (10):8 (but rather than "sequel" and "seeking" read "a sequel" and "searching"). In the margin to the left of these lines are the words "This is a frament" (sic). The three first drafts for the inscription on the West Gate of Moria, on a reproduced manuscript page. Cf. DTS 8, 29, 30, 31. The familiar Elvish greeting Elen síla lúmenna omentielvo, "A star shines upon the hour of our meeting", written for the BBC documentary Tolkien in Oxford . The text contains several errors; most notably, lúmenna is written above the rest and marked for insertion between síla and omentielvo, and elen is mistakenly written "elme". In the video documentary A Film Portrait of J.R.R. Tolkien , Tolkien is seen writing the specimen and reading it aloud. What Tolkien actually reads out loud on the programme is, however, "A star shines upon our meeting". The scene was also included in a memorial television programme on J.R.R. Tolkien, broadcast by Swedish state television's TV1 channel, 29 January 1993, 20:00 local time. Swedish title: "J.R.R. Tolkien Till Minne". The JRRT footage was produced by the BBC for a programme broadcast in 1972 on the Author's 80th birthday. This specimen was written for the same occasion as DTS 70. Beneath a drawing "almost certainly made for Roverandom" is written in ink "Lunar Landscape". NOTE: This a specimen of the Valmaric script, rather than the tengwar. Another sample of this script is DTS 61. The main plate shows a rough sketch from the scene in H. Above it is pencilled "the coming of the eagles" with tengwar. This is probably the first draft for the illustration. The text reads "Ennyn Durin Aran Vória, Pedo Mellon a Minno, im Narvi hain echant, Celebrimbor o Eregion teithant i thiw híw hin". The tengwar text appears twice; both on the arch in the illustration, and also below, accompanied by a transliteration. Cf. DTS 8. Not identical to DTS 25. A second draft for the illustration. It has the text on the arch. Below the draft is also written "im Narvi" in tengwar. Cf. DTS 8. Not identical to DTS 25. A third draft for the illustration. It has the text on the arch. Cf. DTS 8. Not identical to DTS 25. The final design by Tolkien. It is quite similar to the finished illustration which was redrawn by a blockmaster's copyist (DTS 8). It appears that the original also has some writing in both tengwar and cirth on the back side, but it only appears as a faint shadow and is difficult to discern. A draft design for the dust-jacket of LR I. The final design is DTS 2. According to AI, "five designs by Tolkien for the Fellowship of the Ring jacket are extant", in this index designated A-E, the fifth presumably the final and printed version. The tengwar text is, "with minor differences", the ring-inscription in the Black Speech. This draft also has a band of cirth behind the ring, which reads "in the land of shadows where the Mordor lie" (sic). A draft design for the dust-jacket of LR I. The final design is DTS 2. According to AI, "five designs by Tolkien for the Fellowship of the Ring jacket are extant", in this index designated A-E, the fifth presumably the final and printed version. The tengwar text is, "with minor differences"", the ring-inscription in the Black Speech. 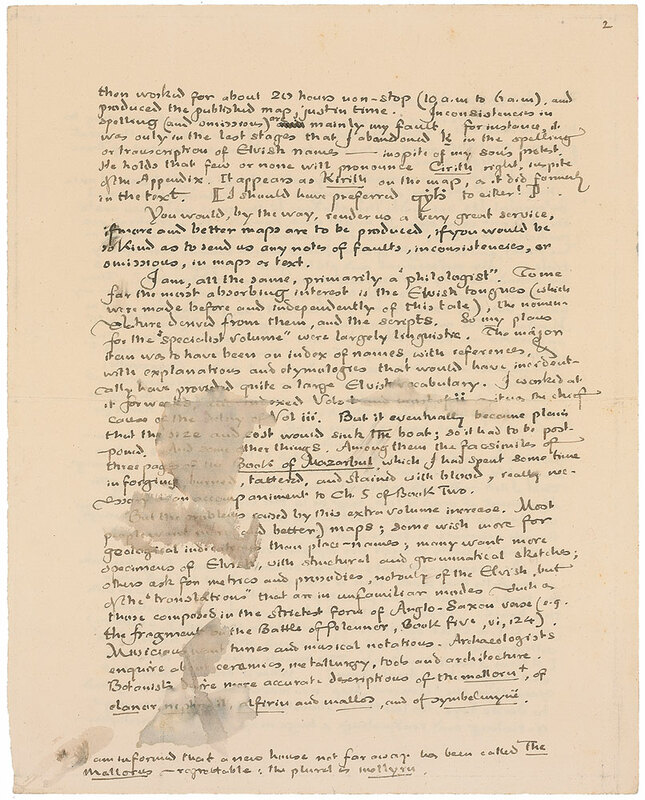 Draft C is "drawn on black paper, with lettering in red and gold" and draft E is "on gray-brown paper". Cf. DTS 63. An early draft for the dust-jacket of LR II. On a band over the picture, is the beginning of the ring-verse in the Black Speech. The tengwar lettering is fairly rough, and hard to read towards the end. A later draft for the dust-jacket of LR II. In two lines behind a ring, is written "in the land of Mordor where the shadows lie" with tengwar. The final rendering of the dust-jacket of LR II. In three lines behind a ring is written "in the land of Mordor where the shadows lie" with tengwar. A design for the dust-jacket of LR III. It was later published, in a simplified form, embossed on the binding of the 1969 deluxe edition of LR. Behind the empty throne of Gondor is written with tengwar "sínome moruvan ar hildinya tenn' ambar-metta". Also, faintly written on the back of the throne are the letters LSR, probably signifying Elessar. On a newspaper page (dated 18/6/60 - 19/6/60 in ink at the top) are doodled various colorful designs, mostly paisley motifs and possibly prototypes for what later became heraldic designs, esp. of Finwe. There is also some tengwar lettering, transcribing and commenting on the headlines: "Spanish praise for Britain", "yomo knyatt" (presumably referring to the Kenyan leader Yomo Kenyatta), "Nationalist backing for new deal". Rough drawings of two emblems of Mordor: a red eye and a winged design titled "Mordor Special Mission Flying Corps Emblem". These are annotated "MSMFC" and "Sauron" with tengwar. The latter name is also rendered in Tolkien's invented script "New English Alphabet". An envelope posted to Tolkien in 1964 or 1965, covered with doodles. Among the doodles are the words "claediuolas", "fatarum", "scandens" and "bubls" written with tengwar, as well as the latin phrase "ab incursu et daemonio meridiano". There are also samples of Tolkien's invented script "New English Alphabet". The heraldic device of Idril. Above it is written "Menelluin Írildeo Ondolindello" with tengwar. One of Lúthien Tinúviel's two heraldic devices, possibly signifying her mother's side. Above is written "Lúthien Tinúviel" with tengwar. One of Lúthien Tinúviel's two heraldic devices, possibly signifying her father's side. Above is written "Lúthien Tinúviel" with tengwar. The second draft of the King's Letter, intended as an illustration for an epilogue to LR. The tengwar text is divided into two columns; on the left is the text in English, on the right in Sindarin. Reference: Vinyar Tengwar 21, "Sí man i·yulmar ...", ill.
"Lot 298 in Sotheby's Auction Catalog 6218, 'The Library of Richard Manney', is a first-edition Lord of the Rings. Vol. 1, The Fellowship of the Ring, is signed by Tolkien and dated '1954', and includes a tengwar inscription". The inscription is a variant of a line in Galadriel's Lament (LR 2 VIII:78-81; c.p. DTS 20 - Namárië). Carl Hostetter deducts that it is written in a Westron mode, and interprets it as "Sí man i·yulmar n(g)win enquantuva", but also notes that this reading is "problematic". Arden Smith suggests (in Vinyar Tengwar #22, p. 5) that the fourth word is in fact "nywin". This inscription can also be found in the Sotheby catalogues 6218 and 8747. A "straightforward" rendering of the book-title "The Return of the King" in tengwar, found on a copy dedicated to Simonne d'Ardenne. The first draft of the King's Letter , intended as an illustration for an epilogue to LR. The tengwar text is divided into two columns; on the left is the text in English, on the right in Sindarin. The third draft of the King's Letter , intended as an illustration for an epilogue to LR. The tengwar text is divided into two columns; on the left is the text in English, on the right in Sindarin. Titled "The page preserved from Edwin Lowdham's manuscript", this is an illustration accompanying the story "The Notion Club Papers", part two "The Strange Case of Arundel Lowdham". Contains a text in Old English (Anglo-Saxon) of Mercian (West-Midland) dialect. The text is transcribed in the story with a translation into modern English. An analysis of the tengwar mode is attached by Christopher Tolkien. "A loose sheet contains the following chart, already given us by R. Stencel ... The forms of the tengwar are the same as those appearing in the printed text so I did not recopy them". The loose sheet was found in Box 7: Series Folder 3: Appendix E.
The mode chart is titled "Alphabet of Fëanor: Numenian, or Westron, Mode." and contains Westron names of the Tengwar: "tó, pí, ché, cá" etc. Reference: Catalogue of an Exhibit of the Manuscripts of J.R.R.T. , "Draft of the Ring-inscription"
A draft version of the ring-inscription (cf. DTS 7). Unlike the final version, this inscription is in English. Transcription: "One ring to rule them all one ring to find them / one ring to bring them all and in the darkness bind them". Reference: Catalogue of an Exhibit of the Manuscripts of J.R.R.T. , "The Lord of the Rings -- Herumillion"
An inscription of the book-title "The Lord of the Rings", and what appears to be a Quenya translation of the title. The stems are doubled in the first tengwa of each word. Transcription: "The Lord of the Rings / Heru imillion"
The beginning of Galadriel's High-elven farewell-song to the Fellowship of the Ring (LR 2 VIII:78-81), going as far as to airetári-lírinen. It is accompanied by a transcription into Roman characters, and an English translation. The reading differs from the one in the book on some points, notably lasse instead of lassi, and mi instead of mí (in both the tengwar and Roman inscriptions). The tengwar inscription differs on many points from DTS 20 - Namárië (q.v.). Tolkien's autograph in Roman letters and tengwar, together with an Elvish greeting, are inscribed on the title-page of a copy of The Fellowship of the Ring . Transcription: "J R R Tolkien / Elen síla lúmenna omentielmo." An inscription of the greeting "Elen síla lúmenn' ómentielmo", found in a copy of The Fellowship of the Ring dedicated to Peter Alford. In a letter to Anthony D. Howlett, Tolkien demonstrates how to write the name Imladrist "in the antique S. mode shown on the gates of Moria" and "[i]n the general use (applicable to both S. and Q.) of the period of the tale". He also shows two different ways to write Rivendell using the latter mode. In the first inscription, one of the tengwar has been crossed over and a correction has been added in the margin (<malta> is corrected to <vala> for m). An inscription of the phrase "Nai hiruvalye Valimar", found on a copy of The Two Towers dedicated to M.R. Ridley. Reference: RS XV ill. 1 "The original description of the writing of the Ring"
A facsimile of Tolkien's first manuscript of Gandalfs and Bilbos first view of the inscription on the One Ring. The manuscript text, including the ring-verse, is reproduced in the book text, but not the two lines of tengwar at the bottom of the manuscript page, probably depicting the ring inscription. The tengwar text is difficult to read, but is most likely some sketchy rendering of the two usual lines of the ring-verse: "One Ring to rule them all..."
A transcription of a word written in the margin of the manuscript Lam na NGoluith, the Early Noldorin Grammar. The margin word is glossed tilt , but the note in PE assigns the reading tailt , "feet". NOTE: This a specimen of the Valmaric script, rather than the tengwar. Another sample of this script is DTS 27. A dedication to Michael Endorion, made in his copy of one of Tolkien's books during the mid 1960's. Transcription: "For Michael son of Middle-earth / Elen síla lúmenn' omentielmo / JRRT"
Reference: Life and Legend item 168, p.
A draft design for the dust-jacket of LR I. The final design is DTS 2. According to AI, "five designs by Tolkien for the Fellowship of the Ring jacket are extant", in this index designated A-E, the fifth presumably the final and printed version. The tengwar text is identical to that of DTS 34, but written in the same style as in DTS 2. Reference: Life and Legend p.
An illustration titled "MS. Tolkien drawings 91, fol.22v" depicts a page covered with doodles and geometric patterns. At the bottom of the page is written, upside down, the words "calma hendas" in tengwar. This inscription was also published in VT 25, p. 7, along with an analysis by Arden R. Smith. Reference: Vinyar Tengwar 45-46, "Addenda and Corrigenda to the Etymologies"
A number of entries in "the Etymologies" contain tengwar or tehtar (omitted as published in The Lost Road) in conjunction with their Elvish names. A summary of the tengwar and tehtar by Arden Smith is found in Vinyar Tengwar 46, Appendix III. The entries containing tengwar or tehtar are: In VT 45: ANÁR-; ANGĀ-; AR1-; ÁS-AT- (p.6); EK-, EKTE- (p.12); GAP- (p.14); GOS-, GOTH- (p.15); ƷEL-; ID- (p.17); ING-; IS-; KAL- (p.18); KHIS-, KHITH- (p.22); KWAL-; KWES- (p.24); KYELEP- and TELEP-; LAB- (p.25); MAN- (p.32); MBARAT- (p.33); NDŪ- (p.38); In VT 46: ÑGOL- (p.3); ÑGYŌ-, ÑGYŌN- (p.4); NYEL-; OKTĀ- (p.7); PAN-; PAR- (p.8); PHIN- (p.9); PUS-; RAN- (p.10); RIK(H)- (p.11); ROM- (p.12); SIL- (p.13); STINTĀ-; SWES-; SWIN-; SYAL- (p.16); TEK- (p.17); TÉLEK- (p.18); TIK- (p.19); UÑG-; UNU-; USUK- (p.20); WAY-; WIG- (p.21); YAK- (p.22). Reference: Vinyar Tengwar 47, Introduction §2, ill.
Three Quenya words denoting the subjects of an essay entitled Eldarin Hands, Fingers & Numerals , occurring next to that title on a piece of cardboard placed before the first page of the typescript. Reference: Vinyar Tengwar 47, Editor's Note 56, ill.
Two words written right to left in rough mirror-image tengwar. In the contemporary essay Eldarin Hands, Fingers & Numerals , Tolkien explains: "If written with the left [hand] (as often in letters or private records) the tengwar were reversed, and were correct in a mirror" ( Vinyar Tengwar 47, Author's Notes to HFN, Note 12). A letter from Tolkien to Alan White, dated "10th July 1964", is signed in both Roman letters and tengwar. A variant of DTS 7 where an "earlier, rejected lettering [by Tolkien] was reproduced by mistake", according to The Lord of the Rings: A Reader's Companion (50 I: 59 [Ring inscription]). Apart from the different calligraphic style, one tengwa is misspelled. Otherwise, it is the same text. It appears in the 2004 HarperCollins printing of the 50:th anniversity edition of LR, and also in some of the 2005 hardcover printings ("based on the reset edition first published 2002", according to the verso of the title-page). Three sentences written for the BBC documentary Tolkien in Oxford , interspersed with analyses and explanations. The first sentence is a transcription of the program title. The second and third are translations of the title into Elvish. At the bottom of this sheet is an explanation of the use of tehtar for vowels. Transcription: "Tolkien in Oxford [...] Arcastar Mondósaresse [...] Arcastar Mondósaresse"
This specimen was written for the same occasion as DTS 26. The letter from Thorin & Co to Bilbo, quoted in H II:9-11. See also DTS 85, DTS 86. The mode used is described in DTS 87 and DTS 88. Reference: Vinyar Tengwar 49, "Five Late Quenya Volitive Inscriptions" I, ill.
A sentence in tengwar, together with the transcription "nai elen siluva parma-restalyanna meldonya", is found on a sheet in a bundle, in which another sheet is dated "July 16, 1964". Carl Hostetter suggests the translation *"May a star shine upon your book-fair, my friend" (ibid. §2). Noting "that on 1 June 1964 Tolkien provided ... his publishers Allen & Unwin with material for display at the World Book Fair in Earl's Court, London, which ran from 10 to 20 June that year, and that Tolkien attended the Book Fair on 15 June (CG1:618-9)", Hostetter suggests that parma-resta is Quenya for 'book-fair' (ibid §10). Reference: Vinyar Tengwar 49, "Five Late Quenya Volitive Inscriptions" IV, NEA 2a:ill.
Three successive drafts for the sentence in DTS 74, on a sheet dated "Aug. 1969". The sheet also bears the note "Inscr. sent to H. St J. Hart, Queen's College, Cambridge" (ibid. §2). Rev. Henry St John Hart was married in August 1969 (ibid. note 7). The sentence can confidently be translated as *'May two stars shine upon the day of your wedding'. (ibid. §4). The three drafts all contain emendations and corrections. Reference: Vinyar Tengwar 49, "Five Late Quenya Volitive Inscriptions" IV, NEA 2b:ill. Possibly the final version of the sentence drafted in DTS 73, accompanied by a calligraphic transcription into Roman letters of the same text. This was apparently written for the wedding of Rev. Henry St John Hart in August 1969; see DTS 73. The sentence can confidently be translated as *'May two stars shine upon the day of your wedding'. (ibid. §4). Reference: Parma Eldalamberon 18, "Tengwesta Qenderinwa" 1 A, ill.
A title in tengwar on the first of three title pages for the work Tengwesta Qenderinwa. Reference: Parma Eldalamberon 18, "Tengwesta Qenderinwa" Foreword §6. A title in tengwar on the second of three title pages for the work Tengwesta Qenderinwa. The page was "struck through with a single diagonal stroke". Reference: Parma Eldalamberon 18, "Tengwesta Qenderinwa" 1 B §1, ill.
"The simple consonants were twenty two in number". These are set out in a table together with transcriptions to tengwar (except the "voiceless form of [ʒ]", for which no tengwa is provided). Reference: Parma Eldalamberon 18, "Tengwesta Qenderinwa" 1 B §5, ill.
"Primitive Quendian possessed five basic short vowels; seven derivative long vowels; and eight diphthongs." These are set out in a table together with transcriptions to tengwar. Reference: Parma Eldalamberon 18, "Tengwesta Qenderinwa" 2 A, ill 1. A title in tengwar on the third of three title pages for the work Tengwesta Qenderinwa. Reference: Parma Eldalamberon 18, "Tengwesta Qenderinwa" 2 A, ill 2. A table of contents for the work Tengwesta Qenderinwa, where the title of each section is given with both Roman letters and tengwar. Authorial transcription: "Lambion Ontale", "Lámaqenta", "Sundokarme", "Lámasampane", "Mestanyatse", "Minqetyarme". Reference: BBC, Antiques Roadshow season 30, episode 4 (34:18-36:48). First broadcast 23 September 2007 on BBC One. An inscription in an autograph album originally belonging to a newspaper/book seller on Charing Cross Station. Book expert Liz Merry dates an inscription by Arthur Conan Doyle in the same album to about 1900-1910, but Tolkien’s inscription must be significantly later. Authorial transcription: "Elen síla lúmenna omentielvo". The word "Ambarkanta" is written in tengwar on a title-page belonging with this work. A title in tengwar on the endpaper for the work Tengwesta Qenderinwa, first version. "Placed before the manuscript of TQ1 is a tattered page originally bearing the title Valarin, written in ink over earlier pencil, and again above and below as ['valarin' in tengwar] in slightly different styles of the same mode of tengwar, both in ink." Dedication to Muriel Margaret (Mollie) Cowling on the free endpaper of vol. 1 of The Lord of the Rings. Transcription: "With the very best wishes of [JRR Tolkien]. I wish that you need not go back 'across so wide a sea'." The author's name is written with Latin letters, and the quotation marks (around "across so wide a sea") are part of the inscription. A neat transcription of Bilbo's Contract, on a page with a table of the Anglo-Sacon futhorc. The mode of this transcription differs from the one of DTS 71. Rateliff notes that according to a personal communication by Arden Smith, the mode "bears strong affinities" to the one of the Ransome letters from December 1937, which have not been published. According to Tolkien's description, this is another transcription of DTS 71 "[i]n a more careful way (as in making a book)", and not "in Thorin's rather free and bold style". An explanation of the tengwar mode of DTS 71 and 86, starting with a tengwar table and continuing with vowels, "various other tricks and abbreviations", punctuation, numerals, and transcription to the Latin script. Like DTS 87, this describes the mode of DTS 71 and 86, starting with a tengwar chart and continuing with consonant tehtar, abbreviations, punctuation, vowels, and a phonemic English ómatehtar mode. DTS 89 - Cotton Minchin "Cirith"
In a letter to J.H. Cotton Minchin (page 2) the word Cirith is written in tengwar (indicated here by an asterisk): "[Christopher Tolkien] holds that few or none will pronounce Cirith right, inspite of the Appendix. It appears as Kirith on the map, as it did formerly in the text. [I should have preferred * to either!]" A few lines of tengwar among other calligraphy on the reverse side of the "Death of Smaug" sketch which, according to a later guess by Tolkien, was drawn around 1936. Among the words are Esgaroth and Smaug the magnificent. Tengwar and cirth specimina scheduled for future incorporation into the Daeron indices. A number of specimina are here listed twice, since there is information in both references useful for the indices. This document has been online since 8 September 1996.